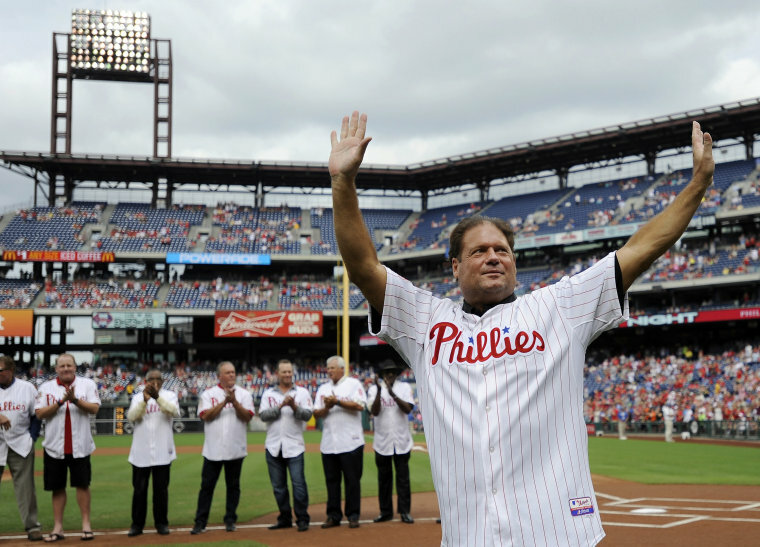 PHILADELPHIA — Darren Daulton, the All-Star catcher who was the leader of the Philadelphia Phillies' NL championship team in 1993, has died. He was 55. Daulton had battled brain cancer since 2013. He had two tumors removed during brain surgery on July 1, 2013, but nine days later was diagnosed with glioblastoma, an aggressive form of brain cancer that also took the lives of his former teammate Tug McGraw and former coach John Vukovich. "Darren was a true leader of men," Phillies chairman emeritus Bill Giles said. "In addition to being an outstanding clubhouse leader, he was also a fighter. He battled through five knee operations to become an All-Star. I really enjoyed watching him for 14 years in uniform. Darren was a super human being. His teammates loved him, I loved him like he was one of my own." Daulton played 14 1/2 of his 15 major league seasons with Philadelphia and finished his career with the 1997 World Series champion Florida Marlins, batting .389 (7 for 18) with two doubles and one homer in a seven-game series against Cleveland. The left-handed hitting Daulton batted .245 with 137 homers and 588 RBIs in 1,161 games. He went to three All-Star games and led the NL with 109 RBIs in 1992. The long-haired Daulton, nicknamed "Dutch," was beloved by Phillies fans and respected by teammates. He policed a wild clubhouse in '93 that included Lenny Dykstra, John Kruk, Dave Hollins, Pete Incaviglia, Mitch Williams and Curt Schilling. "From the day that we drafted him until today, he constantly earned our respect and admiration as both a player and person," said Phillies chairman David Montgomery. "Darren was the face of our franchise in the early 1990's." Daulton is survived by his parents, Carol and Dave; brother, Dave Jr.; wife, Amanda; and his four children: Zachary, Summer, Savannah and Darren Jr.